----> FREE ACT & SAT Math Formula Sheet Here! - Take a practice test. Decide whether you want to time yourself for your first one or two practice tests. There are 60 questions and 60 minutes allowed for the math section of the ACT. You may want to set a timer for 60 minutes then go through and see which ones you missed to get an idea of your score. You can then go back and take some additional time to look at the ones you may not have had time to complete. You can use a calculator throughout the entire math section. For the SAT there are 2 sections. One is a 25 minute 20 question no-calculator section. The other is a 55 minute 38 question calculator section. Both sections are composed of multiple choice as well as free response(grid-in) questions. With the new SAT there is no penalty for guessing like there was with the old version of the test. So try to narrow down your answers and make your best guess if needed. - Keep a running Formula/Note sheet. 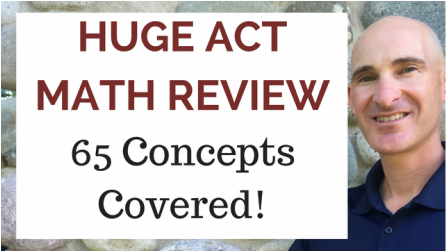 There are a number of key formulas and concepts that you are expected to have learned from your previous math classes that are tested on the ACT and SAT. (The SAT does give you a few formulas at the beginning of the math sections if you need them.) Memorize these formulas and keep a running list of them so you can use it as your own personalized study guide. - Go over the problems you missed. This is where a tutor can be very helpful. I can help you understand efficient ways to approach the problems you missed and to recognize the often disguised concept that they are testing you on. - Repeat! This is where some discipline comes in. Students will often take a practice test offered by their school then take the test for real and that's it! For most students, this will not be enough to substantially increase their score. Commit yourself to setting an hour aside a week to take a practice test then go over with a tutor the ones you missed discussing the concepts as well as similar problems. I recommend doing this 4 to 5 times. This will give you the experience you need to become very familiar with the wording of the questions, recognizing what is being asked by a given problem, and to see similar problems enough times to increase your speed. - If you are looking for additional help preparing (above and beyond taking practice tests) get my video courses for sale (above) to help you review key concepts tested as well as sample problems as they often appear on the actual test.